“Yous fellas fishin’?” a Maori guy asked on the shore of Lake Otomangakau. I said we were having a look. “Plenty a fish here, bro. Big bastards, too. But bloody hard to catch, ay.” He was lean and hard, dressed in a bush shirt and hunting shorts, both of which had a lived-in, heavy-use look, and his legs and arms were scratched with bush lawyer and blackberries, the barbed wire of the backcountry. Behind him was a camp that looked like a mobile butcher’s workshop. Next to an old-style calico tent, a tarp lean-to and a stainless-steel log burner, game carcasses wrapped in fine white muslin against the blowflies were hung from meat hooks on all available trees. On one of the logs that served as campfire chairs his companion sat pulling an oily swab through the barrel of a large-calibre rifle. 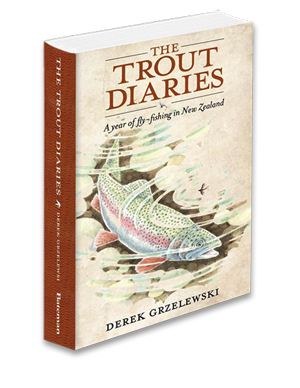 The man’s summary of fishing at the lake—big, challenging trout and plenty of them—was precisely what had attracted us here. Sure enough, we saw the first fish—a large shape shadowing against a patch of dark-gold sand—as soon as we reached the waterline. Marc Petitjean was with me, but even his masterly casts and best-money-can-buy flies made no impression on this or any other fish we saw. The trout were weary, not so much spooking but shying from casts and flies, not giving us even one honest opportunity. Marc made a face of mock dejection. “This lake is not a place for a casual drive-by fishing,” he said. “It needs to be studied and understood before anything of consequence happens here.” He couldn’t have known it, but this was exactly what I had planned for the next few days. For now, we were just filling a couple of hours before Marc’s afternoon flight to Christchurch, where he was to give one last fly tying demo, then returning home to Fribourg. Before we left for the airport, I went back to the Maori hunters to ask them if there was anywhere nearby I could camp. “Come and have a feed with us,” he said, and when I joined them by their great incinerator fire he picked up an enamel plate from a sheet of corrugated iron that served as a dish-drying rack and heaped it with venison steaks and token stalks of boiled broccoli. Then he took a dinged-up mug, half filled it with Jim Beam and handed them both to me. We ate in contented silence, the lake behind us so still that even the stars reflecting in it did not shimmer. These two, I thought to myself, were my kind of people. My tribe. In the morning, while I readied for the first exploratory recce of the lake and its trout, the fellas were already off hunting. This, it turned out, they did every day, leaving around 4 a.m., usually bagging something at first light, returning to the camp around 9 a.m., a day’s work already accomplished. They rarely came back empty-handed. If it wasn’t a red deer or two, it was a wild pig or, once, a five-foot eel which instantly triggered memories of a trip into the Amazon and the anaconda I’d seen there. Later in the day, they often left the camp and went visiting various branches of the whanau: cousins, uncles and nannas, to bestow the gifts of the forest on them. It was summer holidays, the time of reunions, barbeques, hangis and other feasts, and some of the families were hard up. There was nothing like a leg of venison or wild pork chops to put smiles on their faces. My camp fellas seemed to get as big a kick out of that as they did from hunting itself. That first day I failed my grades because, true enough, there were problems—many problems—most of them unanticipated. The first and fundamental issue was how to cast effectively from a drifting row boat. This is more complicated than it sounds. The fish I sighted prowling the shallows moved with speed and determination while the boat, too, had its own inertia. The moment I put down the oars to cast, the boat would acquire a mind of its own, pushed and spun around by the wind—it was rare to have a windless day on the O—and it would drift either away from the fish, or worse, directly at and over it. Then, of course, it wasn’t enough just to cast a fly to the fish, you had to put it a good few metres ahead, let things settle and wait for the trout to approach, by which time the boat had invariably drifted one way or another, dragging the fly or spooking the fish. After a morning of frustration and bungled opportunities I rowed back to the camp with a plan in mind. What I needed was a soft, quiet and quickly deployable anchor. This would not stop the boat from spinning—to counteract that you’d need two anchors, fore and aft, and in the time needed to drop both the fish would certainly be gone—but at least it’d stop it from drifting about or away. I found a canvas bag and part-filled it with stones, then attached a length of rope to it which in turn I tied to the transom. After some experimentation I found the most efficient way was to row with the anchor already overboard but above water, holding its coiled rope down with my foot. When I saw a fish all I had to do was to slowly lift my foot and let the anchor slide down, and this I could do while standing up and getting ready to cast. The timing was critical, as the window of opportunity to present a fly to a cruising fish often lasted only a few seconds. By the first afternoon I was getting better at this juggling of oars, rod and anchor, while calculating the vectors of moving fish, boat and wind, when a dark overcast promptly blew in and covered the lake with whitecaps. In glary, corrugated water I could not see a thing. I rowed back to the camp. It was clear that sight fishing the big O required perfect conditions—the right water level, good sunlight, not too much wind—or the already feeble odds would quickly deteriorate into none at all. “Hang on to him, bro. Don’t let ’im. . .” they shouted but it was too late. There were extensive weedbeds between us and the island, and that’s where the fish was heading. The backing was down to half when it stopped moving. I reeled it in, trailing a handful of weeds all the way to my feet. In the weeds was my light damsel nymph at the end of a mangled tippet, overstretched and warped, with a tiny fish scale still pierced by the tip of the hook. In the evening air the disappointment was palpable. “You shouda used a bigger hook,” one of the bros offered. Later that night, I revisited the words of advice John Kent gave about Otomangakau in his North Island guidebook. If you land one fish in four, he wrote, you’re doing really well. It seemed I was making progress after all.